^ All winds are one-minute sustained unless otherwise noted. ^ The figures for maximum sustained winds and position estimates are rounded to the nearest 5 units (knots, miles, or kilometers), following the convention used in the National Hurricane Center's products. Direct wind observations are rounded to the nearest whole number. Atmospheric pressures are listed to the nearest millibar and nearest hundredth of an inch of mercury. ^ All monetary totals are in 2015 values of their respective currency unless otherwise noted. ^ a b c d e f g h i j k l m Todd B. Kimberlain; Eric S. Blake; John P. Cangialosi (February 1, 2016). Hurricane Patricia (PDF) (Report). Tropical Cyclone Report. Miami, Florida: National Hurricane Center. Retrieved February 4, 2016. ^ Todd B. Kimberlain (October 20, 2015). Tropical Depression Twenty-E Discussion Number 1 (Report). Miami, Florida: National Hurricane Center. Retrieved February 7, 2016. ^ Richard J. Pasch (October 22, 2015). Hurricane Patricia Discussion Number 8 (Report). Miami, Florida: National Hurricane Center. Retrieved February 5, 2016. ^ Stacy R. Stewart (October 22, 2015). Tropical Storm Patricia Discussion Number 7 (Report). Miami, Florida: National Hurricane Center. Retrieved February 5, 2016. ^ Michael J. Brennan (October 22, 2015). Hurricane Patricia Special Discussion Number 10 (Report). Miami, Florida: National Hurricane Center. Retrieved February 7, 2015. ^ Michael J. Brennan (October 22, 2015). Hurricane Patricia Discussion Number 11 (Report). Miami, Florida: National Hurricane Center. Retrieved February 7, 2015. ^ Dennis Mersereau (October 23, 2015). "At 200 MPH, Hurricane Patricia Is Now the Strongest Tropical Cyclone Ever Recorded". The Vane. Gawker Media. Archived from the original on October 23, 2015. Retrieved October 23, 2015. ^ Eric S. Blake (October 23, 2015). Hurricane Patricia Advisory Number 12 (Advisory). Miami, Florida: National Hurricane Center. Retrieved October 26, 2015. ^ a b Marshall Shepherd (October 24, 2015). "Coverage of Hurricane Patricia Was Not Overblown, Likely Life-Saving". Forbes. Forbes Inc. Retrieved October 26, 2015. ^ "Hurricane Patricia overblown? Storm weakens to Category 2, falls short of 'catastrophic'". The Post-Standard. Puerto Vallarta, Mexico. Associated Press. October 24, 2015. Archived from the original on October 28, 2015. Retrieved October 28, 2015. ^ Jason Samenow (October 26, 2015). "How Patricia, the strongest hurricane on record, may have miraculously killed so few". The Washington Post. Retrieved October 26, 2015. ^ Carlos Guerrero (October 22, 2015). "Huracán 'Patricia' provocará en tres estados la lluvia de todo un año" (in Spanish). Mexico City, Mexico: Noticieros Televisa. Retrieved October 22, 2015. ^ "Huracán Patricia de categoría 4 se acerca a costas de México". El Nuevo Herald (in Spanish). Mexico: The McClatchy Company. Associated Press. October 22, 2015. Archived from the original on October 24, 2015. Retrieved October 22, 2015. ^ "Suspenden clases en Guerrero por huracán 'Patricia'". El Universal (in Spanish). Acapulco, Mexico. Notimex. October 22, 2015. Retrieved October 26, 2015. ^ "Activan operativo de emergencia en Jalisco por 'Patricia'; suspenden clases" (in Spanish). Mexico City, Mexico: Noticieros Televisa. October 22, 2015. Retrieved October 22, 2015. ^ "Evacúan a unas 50 mil personas por huracán Patricia" (in Spanish). TeleSUR. Notimex. October 23, 2015. Retrieved October 26, 2015. ^ a b Saúl Prieto (October 23, 2015). "Presumen capacidad de evacuación ilimitada por 'Patricia'". El Informador (in Spanish). Guadalajara, Mexico. Retrieved October 26, 2015. ^ a b c d Pierre-Marc René; Raul Torres; Juan Cervantes; Angel Arrieta (October 25, 2015). "Reportan afectaciones en 4 estados por 'Patricia'". El Universal (in Spanish). Mexico City, Mexico. Retrieved October 25, 2015. ^ a b c "Más de 3,000 hectáreas de cultivos sufrieron daños por el huracán Patricia". Univision (in Spanish). Univision Communications. October 26, 2015. Retrieved October 26, 2015. ^ a b "Red Cross ramps up preparedness as strongest hurricane ever recorded bears down on Mexico". International Federation of Red Cross And Red Crescent Societies. ReliefWeb. October 24, 2015. Retrieved February 7, 2016. ^ a b "Mexican Red Cross starts damage assessment". International Federation of Red Cross And Red Crescent Societies. Geneva, Panama: ReliefWeb. October 25, 2015. Retrieved October 26, 2015. ^ a b c William Neuman; Elisabeth Malkin (October 24, 2015). "Lessons of Past Disasters Helped Mexico Sidestep the Brunt of a Hurricane". The New York Times. Mexico City, Mexico: The New York Times Company. Retrieved October 26, 2015. ^ a b Paolina Albani (October 22, 2015). "Evacuan a 2,100 por el temporal estacionario". Siglo21 (in Spanish). Corporación de Noticias. Archived from the original on October 25, 2015. Retrieved October 22, 2015. ^ a b J. Lopez; F. Rodriquez (October 20, 2015). "Lluvias han afectado a 223 mil guatemaltecos". elPriódico (in Spanish). Retrieved October 22, 2015. ^ Patricia Gómez (October 22, 2015). "Temporal afectó 28.2 mil hectáreas en Santa Rosa". Siglo21 (in Spanish). Corporación de Noticias. Archived from the original on March 3, 2016. Retrieved October 22, 2015. ^ a b c Carlos Segovia; Insy Mendoza; Susana Joma (October 17, 2015). "Un muerto, inundaciones y desbordamiento de ríos por lluvias en el oriente". elsalvador.com (in Spanish). Concepción de Oriente, El Salvador: El Diario de Hoy. Retrieved October 22, 2015. ^ a b "Cuatro muertos, daños y suspensión de clases a causa de las lluvias". elsalvador.com (in Spanish). El Diario de Hoy. October 18, 2015. Retrieved October 22, 2015. ^ "Más de 200 familias evacuadas por inundaciones". La Tribuna (in Spanish). October 19, 2015. Retrieved October 22, 2015. ^ "Se desborda el río Ulúa en el occidente y norte de Honduras" (in Spanish). Santa Bárbara, Honduras: La Prensa. October 17, 2015. Retrieved October 22, 2015. ^ Hufo Solano (October 19, 2015). "Barriadas de Jacó sufrieron grandes pérdidas por inundaciones" (in Spanish). La Nación. Retrieved October 22, 2015. ^ Silvia Hernández (October 20, 2015). "Lluvias provocan daños en mil 500 casas de Chetumal". El Universal (in Spanish). Quintana Roo, Mexico. Retrieved October 28, 2015. ^ "Daños por lluvias en Chetumal ascienden a 1,400 mdp: alcalde" (in Spanish). Chetumal, Mexico: Unión Cancún. October 23, 2015. Retrieved October 28, 2015. ^ "Busca Quintana Roo declaratoria de desastre para 7 municipios" (in Spanish). Chetumal, Mexico: El Diario. October 20, 2015. Retrieved October 28, 2015. ^ Isabel Zamudio; Hermes Chávez; Óscar Rodríguez (October 21, 2015). "Reportan daños por lluvias en más de 50 alcaldías de Veracruz". Milenio (in Spanish). Xalapa, Mexico. Retrieved October 28, 2015. ^ "Fenómenos meteorológicos dejan daños, deslaves y pérdidas al sur de México". CNN Mexico (in Spanish). Turner Broadcasting System. Notimex. October 20, 2015. Retrieved October 28, 2015. ^ "Graves daños dejan lluvias en Oaxaca, alertan de deslaves carreteros". Ciudadanía Express (in Spanish). Oaxaca, Mexico. October 21, 2015. Retrieved October 28, 2015. ^ Fredy Martín Pérez (October 21, 2015). "Se inundan 12 colonias por 'Patricia' en Chiapas". El Universal (in Spanish). Tapachula, Mexico. Retrieved October 22, 2015. ^ "Deja tormenta severos daños a familias de Chiapas" (in Spanish). Chiapas, Mexico: W Radio. October 23, 2015. Retrieved October 28, 2015. ^ "Se fue 'Patricia'... pero continuarán las lluvias en 21 estados y el DF". CNNMéxico (in Spanish). Mexico City, Mexico: Turner Broadcasting System. October 25, 2015. Retrieved October 26, 2015. ^ "Los remanentes de 'Patricia' aún generarán fuertes lluvias en México". CNNMéxico (in Spanish). Turner Broadcasting System. October 24, 2015. Retrieved October 26, 2015. ^ a b c "6 Deaths in Mexico linked to Hurricane Patricia". Fox Nes Latino. EFE. Retrieved October 25, 2015. ^ a b c "Diez mil damnificados y dos muertos, el saldo de Patricia". Proceso (in Spanish). Mexico City, Mexico: Zócalo Saltillo. October 26, 2015. Retrieved October 26, 2015. ^ a b Raúl Torres (November 28, 2015). ""Patricia" dejó daños por más de mil 139 mpd". El Universal (in Spanish). Guadalajara, Mexico. Retrieved December 2, 2015. ^ a b Martín Aquino (November 23, 2015). "Reporta Colima daños por mil 700 mdp". Mural (in Spanish). Guadalajara, Mexico. Retrieved December 2, 2015. ^ a b Carlos Arrieta (October 26, 2015). 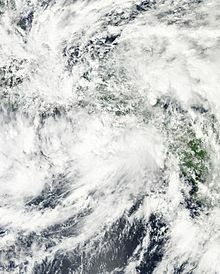 "Patricia colapsó la costa de Michoacán" (in Spanish). Michoacán, Mexico: W Radio. Retrieved October 26, 2015. ^ a b Rosamaría Sánchez (October 26, 2015). ""Patricia" dejó daños de 13.5 millones de pesos en Michoacán". Provincia (in Spanish). Michoacán, Mexico. Retrieved October 27, 2015. ^ a b Josh Morgerman (November 2, 2015). iCyclone Chase Report: Hurricane Patricia (PDF) (Report). iCyclone. Retrieved November 2, 2015. ^ "Patricia effect: Texas deluged, flash floods smash Houston". Java Studio Arsitek. USAToday. Retrieved October 25, 2015. ^ Pierre-Marc René (October 28, 2015). "Sedesol reporta 9 mil viviendas dañadas por "Patricia" en Jalisco". El Universal (in Spanish). Jalisco, Mexico. Retrieved October 28, 2015. ^ Jennifer Gonzalez Covarrubias (October 25, 2015). "Hurricane flattens Mexico homes, but no major disaster". Agence France-Presse. Chamela, Mexico: ReliefWeb. Retrieved February 7, 2016. ^ a b Raúl Torres (October 28, 2015). "Calculan en 168 mdp pérdidas en cultivos por "Patricia"". El Universal (in Spanish). Mexico City, Mexico. Retrieved October 28, 2015. ^ "Los Llanitos". Marine Traffic. 2015. Retrieved October 26, 2015. ^ "Hurricane Patricia wedges huge cargo ship between rocks". 9news.com.au. ninemsn. October 26, 2015. Retrieved October 26, 2015. ^ * "Update: Bulk carrier LOS LLANITOS probably a total loss". Vessel Finder. October 27, 2015. Retrieved December 19, 2015. Greg Norman (February 9, 2016). "The dangerous business of ship salvage". Fox News Channel. Retrieved February 26, 2016. "Aseguradora incumple para desmantelar buque 'Los Llanitos'" (in Spanish). Colima, Mexico: Noticieros Televisa. February 24, 2016. Retrieved February 26, 2016. ^ Juan Carlos Flores (October 25, 2015). "Calculan daños en Colima por más de 112 millones de pesos". La Jordana (in Spanish). Colima, Mexico. Retrieved October 25, 2015. ^ a b Raquel Flores (October 25, 2015). "Incomunicadas 380 comunidades en Michoacán por Patricia" (in Spanish). Grupo Fórmula. Archived from the original on October 27, 2015. Retrieved October 26, 2015. ^ Fátima Miranda (November 23, 2015). "Con daños, mil 639 casas por 'Patricia'" (in Spanish). La Voz de Michoacán. Archived from the original on November 27, 2015. Retrieved December 2, 2015. ^ a b Sergio Lemus (October 28, 2015). "Patricia deja 2 mil viviendas afectadas en Michoacán". La Voz de Michoacán (in Spanish). Morelia, Mexico. Archived from the original on October 28, 2015. Retrieved October 28, 2015. ^ ""Patricia" deja primeros daños en el País" (in Spanish). Mexico City, Mexico: Frontera. October 22, 2015. Retrieved October 22, 2015. ^ "Evalúan daños en Tamaulipas por remanentes de 'Patricia'". El Informador (in Spanish). Reynosa, Mexico. October 27, 2015. Retrieved October 28, 2015. ^ Greg Botelho (October 24, 2015). "Torrential rain -- up to 20 inches in spots -- pummels much of Texas". CNN. Turner Broadcasting System. Retrieved October 26, 2015. ^ Tom Dart (October 25, 2015). "South-east Texas avoids extensive flood damage after hurricane Patricia fears". The Guardian. Guardian Media Group. Retrieved October 26, 2015. ^ Amanda Orr (October 25, 2015). "In Hurricane Patricia's wake, torrential rains move into Louisiana". Houston, Texas: Reuters. Archived from the original on October 26, 2015. Retrieved October 26, 2015. ^ Texas Event Report: EF0 Tornado. National Weather Service Office in Houston/Galveston, Texas (Report). National Climatic Data Center. 2016. Retrieved February 26, 2016. ^ Texas Event Report: Heavy Rain. National Weather Service Office in Corpus Christi, Texas (Report). National Climatic Data Center. 2016. Retrieved February 26, 2016. ^ Amanda K. Fanning (October 24, 2015). Storm Summary Number 10 for Southern Plains Heavy Rainfall (Report). College Park, Maryland: Weather Prediction Center. Archived from the original on October 26, 2015. Retrieved October 26, 2015. ^ Amanda K. Fanning (October 24, 2015). Storm Summary Number 15 for Southern Plains Heavy Rainfall (Report). College Park, Maryland: Weather Prediction Center. Archived from the original on October 26, 2015. Retrieved October 26, 2015. ^ "5 mil 791 marinos ayudan a damnificados por Patricia" (in Spanish). Terra Networks. October 25, 2015. Archived from the original on October 26, 2015. Retrieved October 26, 2015. ^ Jorge Velazco (October 29, 2015). "Darán 76 millones a Jalisco por huracán "Patricia"". Milenio (in Spanish). Guadalajara, Mexico. Retrieved October 29, 2015. ^ Angélica Enciso Landeros (October 28, 2015). "Destinarán $34 millones a afectados en Colima por 'Patricia': Meade". La Jordana (in Spanish). Manzanillo, Mexico. Retrieved October 28, 2015. ^ "Sector ambiental presenta reporte de daños en Colima por 'Patricia'" (in Spanish). Ángel Guardian. October 27, 2015. Retrieved October 28, 2015. ^ "Declaran desastre en 15 municipios; aumentan daños registrados en casas". El Informador (in Spanish). Guadalajara, Mexico. October 28, 2015. Retrieved October 28, 2015. ^ "Apoya INADEM a afectados por huracán". Milenio (in Spanish). Guadalajara, Mexico. January 21, 2016. Retrieved February 7, 2016. ^ Angelina Arredondo Elizalde (January 11, 2016). "Continúa el apoyo a afectados por huracán "Patricia"". Provincia (in Spanish). Morelia, Mexico. Retrieved February 7, 2016. 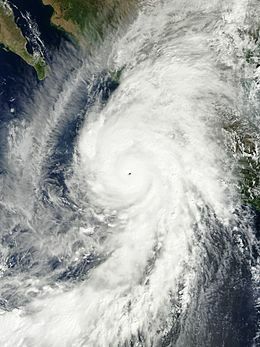 Wikimedia Commons has media related to Hurricane Patricia.